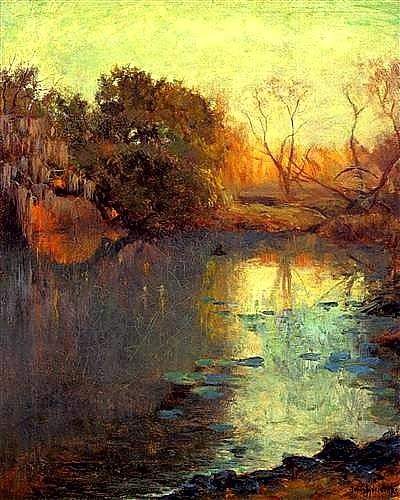 The Quarry, Julian Onderdonk. Bluebonnets became his trademark. It's strange, funny, maybe even disturbing, the way we all associate geographical areas with certain styles and content areas in art. If I were to mention Holland, most people would think of windmills and tulips, and perhaps the Dutch Golden Age works of the 17th-century. If I mentioned New York then the Ashcan School or Abstract Expressionism would come to mind. If I mentioned Florida, it would be palm trees, beaches, rockets, and NASCAR (or golf). If I mentioned Texas you'd think cattle, prairie, perhaps cowboys, Indians, desert landscapes, and oil derricks, all painted in a traditional, realistic, conservative manner. What would probably not come to mind, in the case of Texas, would be colorful Bluebonnets, live oaks, seascapes, peach orchards, or Impressionism. Unless you were from Texas, the name Onderdonk would likely not cross your mind either, though that family is practically synonymous with Texas art. President George W. Bush had three Onderdonk paintings hanging in the Oval Office during his term. Meet the Onderdonks, Eleanor, Julian (self-portrait) and Robert J. 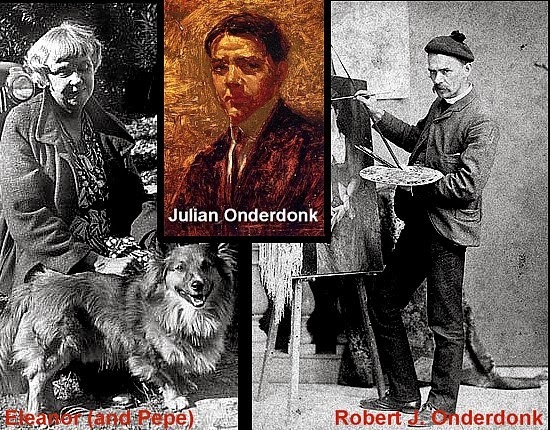 Actually, there were three Onderdonk artists, Robert Jenkins Onderdonk (above, right), his sister, Eleanor Onderdonk (above, left), and Robert's son, Julian Onderdonk (above, center). Yes, Onderdonk is their real name (no one would make up a name like that). When dealing with art families, sometimes it's hard to decide which member to highlight. The father, Robert J., was likely the more prolific of the three, concentrating on traditional Texas folklore, landscapes, portraits, and in teaching art. His sister, Eleanor's art was more inclined toward women, children, portraits, still-lifes and a few landscapes. They were also fewer in number. Julian, on the other hand, despite his relatively short life, (1882-1922) came with the better training pedigree. He studied first with a local artist as a boy, then under his father as a teen, followed by a stint in New York under his father's instructor, William Merritt Chase, and the Art Students League. The younger Onderdonk has been called by some "the father of Texas painting," which may be a stretch, but not without some merit (of the Wm. Merritt Chase variety). As sons sometimes do, Julian made up his mind early in life not to be his father's son. That is to say, there is a significant difference in both style and substance between the two. Robert, the father, was a traditional Realist. 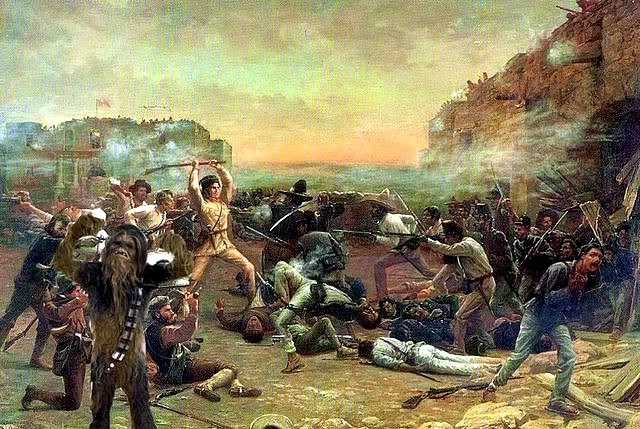 His painting of Davy Crockett and The Fall of the Alamo (above) is probably his most famous, his best, and is most typical of his work. Notice the hairy figure in the lower left corner, said to be "Sal Squatch," a friend of Mr. Crockett (the figure went largely unnoticed until the painting was recently cleaned). There actually are some historical references to such a figure. 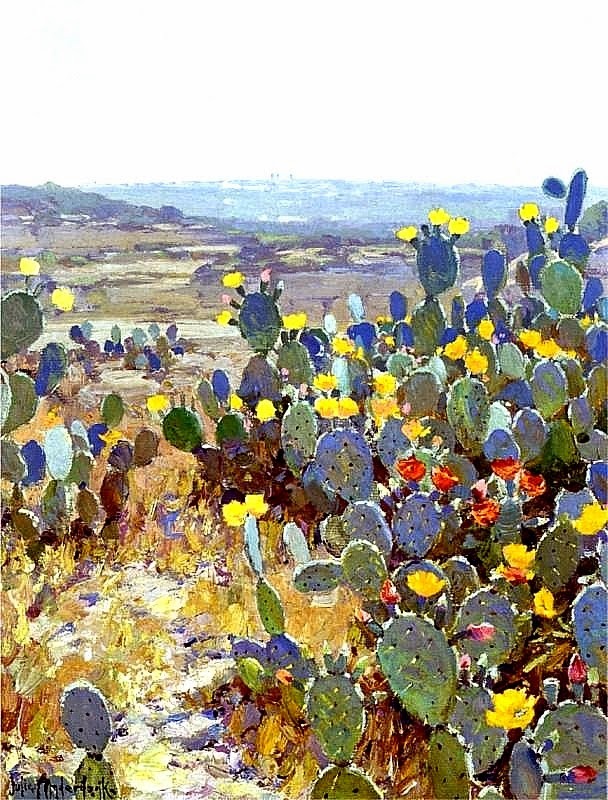 Julian Onderdonk, by way of contrast, was a William Merritt Chase impressionist, not a portrait painter, not a genre painter, nor was he a teacher like his father, but interested only in the more colorful aspects of the Texas landscapes. 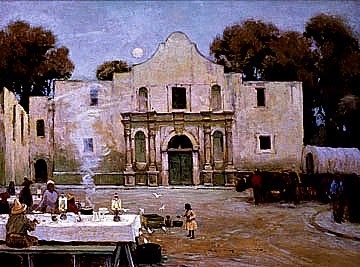 Except for Julian's own Alamo scene, Chili Queens at the Alamo (above, right), his work seldom contains human life. 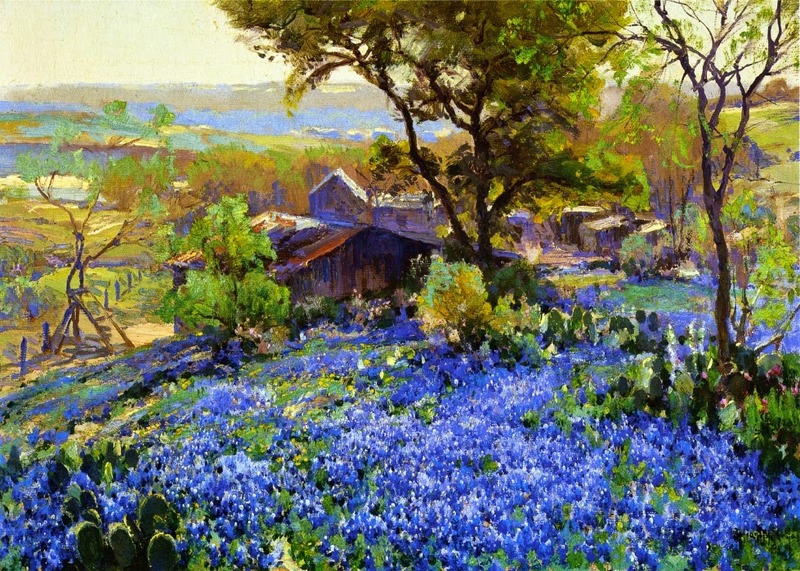 Julian Onderdonk's The Quarry (top) is typical of much of his work, especially his love of Bluebonnets. At one point in his life, Julian set up shop in New York during the early 1900s, where he had little success. 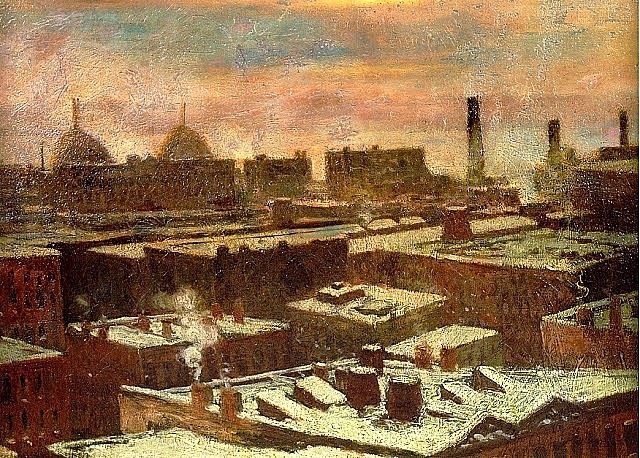 His View of City Rooftops (above), from 1902, speaks volumes as to the loneliness of a big city in winter. He returned to San Antonio in 1909. Julian's San Antonio River (above, left) was painted shortly after his return to Texas. 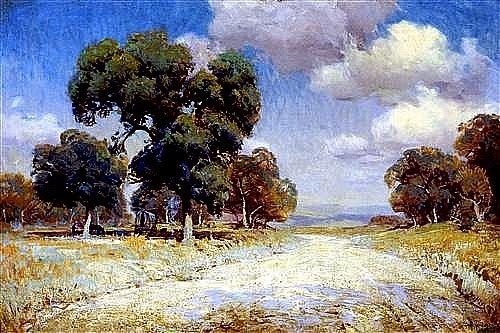 Although highly revered by the Texas art community today, there is little in Julian Onderdonk's work that screams "TEXAS!!" In fact, most of his scenes could literally pass for some of the more colorful parts of virtually every state in the country. 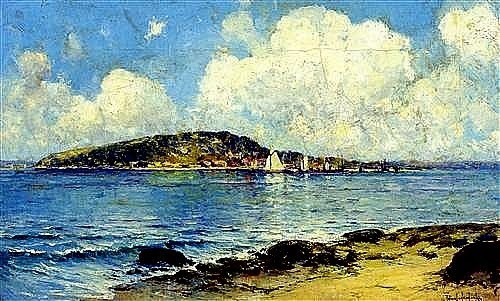 His Coastal Scene (above) is such an example. 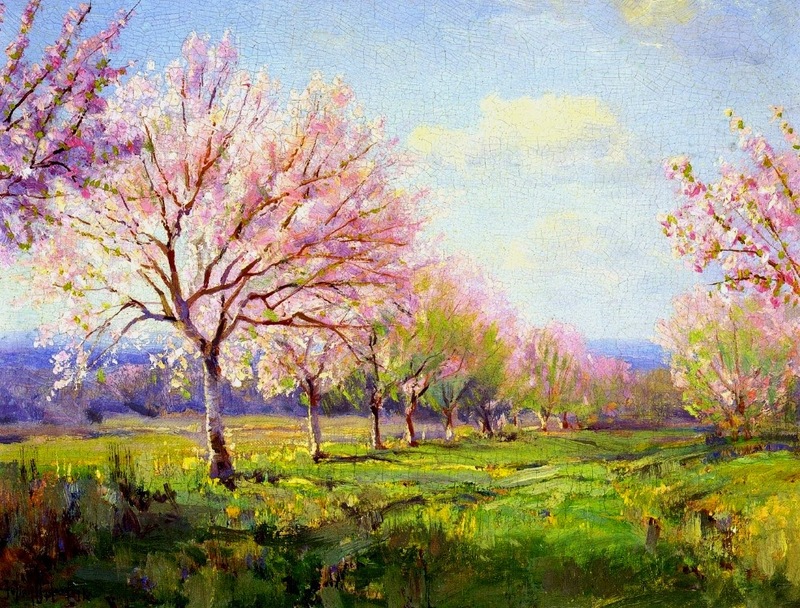 I have little doubt that the "Peach Tree State" of Georgia would have second thoughts in claiming Onderdonk's Peach Orchard on Mavericks Farm (below) from, 1915. I suppose Onderdonk's Landscape with Cacti (right) might be limited geographically to the Southwest, but even so, it is as appealing for its style and color as for its content. Perhaps Onderdonk's most typically Texas painting (aside from the Prickly Pears) would be his Landscape with Wagon (bottom), though you may have to hunt for the wagon.